The consultation was sparked by the rise of racist ideologies that are more often than not fed by nationalist discourses. “The fact is that religions of all hues have enmeshed themselves with dominant and dominating ideologies and have provided the ideological underpinnings of racism and other cultures of discrimination,” said Philip Vinod Peacock, WCRC executive secretary for witness and justice. 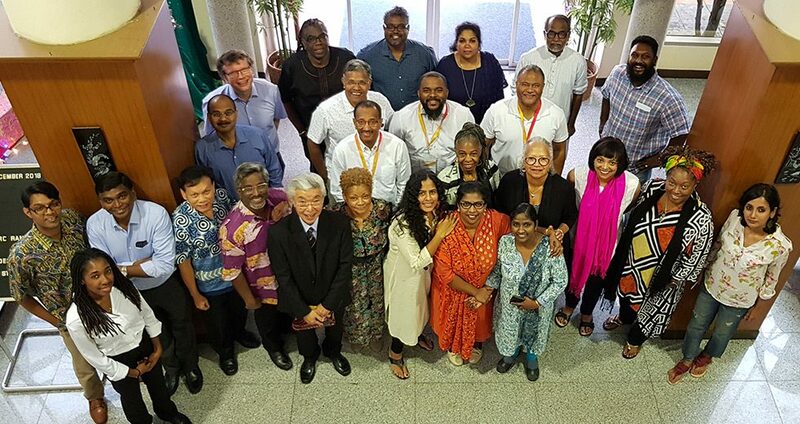 The consultation gathered together Dalits and people of African descent from the Americas to seek to redeem religion from the idolatry of power and privilege by drawing from theologies and ideologies that intentionally have positioned themselves outside of traditional power structures. Meeting initially in Bangalore, the group was exposed to the Dalit reality in India. They visited the Kolar Gold Fields, where Dalits work in dire conditions, and a Dalit community in the city itself. Two Dalit activists, Ruth Manorama and Alphonse G. Kennedy, deepened understandings through stories of resistance. Building from lessons learned during the struggle against apartheid in South Africa, Boesak, said, “[W]e may speak today of a phenomenon called ‘global apartheid’ which includes socio-economic exploitation and inequalities, political exclusion, racial and ethnic discrimination, as well as gender injustice and heteronormative oppression. “The common element here is the systemic, violent, pervasive and totalitarian nature of that oppression. …In a more precise sense, ‘global apartheid’ is best understood in the all-encompassing, global expression of what we call ’empire,’ a reality we can no longer afford to keep out of the discussion. “Although in South Africa we were serious and effective in our engagement with the perversion of the Reformed tradition exposited in the theology of apartheid, we did not grasp the vast ramifications of the argument about empire as it pertains not just to white racism and its onslaught on black humanity, but white supremacy and white privilege as essential, and indispensable functions of white, global Christian imperialism,” he continued. Presentations were made by Kerri Allen, Michael Blair, Iva Carruthers, Joseph Prabhakar Dayam, Aruna Gogulamanda, Nikhila Henry, Billy Michael Honor, Jayachitra Lalitha, Michael Livingston, Deenabandhu Manchala, Monica Melanchthon, Immanuel Nehemiah, Satvasheela Pandhare, Peniel Rajkumar, Vasantha Rao, Rodney Sadler, Anne Smith, Mitzi Smith, James Elisha Taneti and Karen Georgia Thompson along with Chris Ferguson, WCRC general secretary, and Hanns Lessing, WCRC executive secretary for communion and theology. “We conclude that such dehumanization, denigration and devaluation of any human being is sin. Such behavior violates a Christian faith that all human beings are created equally in God’s image (Genesis 1:26-27). “[W]e understand our faith to emphasize that we are called to treat all humanity as neighbours in ways that we would wish to be treated (Leviticus 19:18b; 33-34), called by God to intervene on behalf of one another when found in need (Luke 6:27-31), and that our treatment of those deemed the least among us evidences our Christian covenant with God and one another (Matthew 25:31-46). “As such, we call upon the World Communion of Reformed Churches to act now by implementing programming and engaging the process of status confessionis,” a request that will be taken up by the WCRC Executive Committee. Read the consultation’s full statement. Read Boesak’s full keynote address.